Jivamukti Yoga is the real deal — one-stop shopping for a complete yoga experience. If you know that there is more to yoga than merely asana & have been hungry for a practice that satisfies your heart & mind as well as your body, that encourages & supports your evolution, you may need to look no further. Jivamukti is a dynamic vinyasa-style practice embodying five tenets — nonviolence, devotion, meditation, music & holy texts — whose goal is to create a multidimensional experience that expands consciousness, that allows you to connect more deeply to everyone and everything around you, that, well, allows you to experience Yoga. But don’t worry, it also generates plenty of sweat! Sharon Gannon and David Life were musicians and artists when Sharon and her band showed up to play a gig at David’s Life Café in the East Village in New York in the early 1980s. Fast-forward to 1986, when they traveled to India and met their first guru, Swami Nirmalananda. On subsequent trips, they met their guru Sri K. Pattabhi Jois, and later in upstate New York, they met their guru Shri Brahmananda Sarasvati. 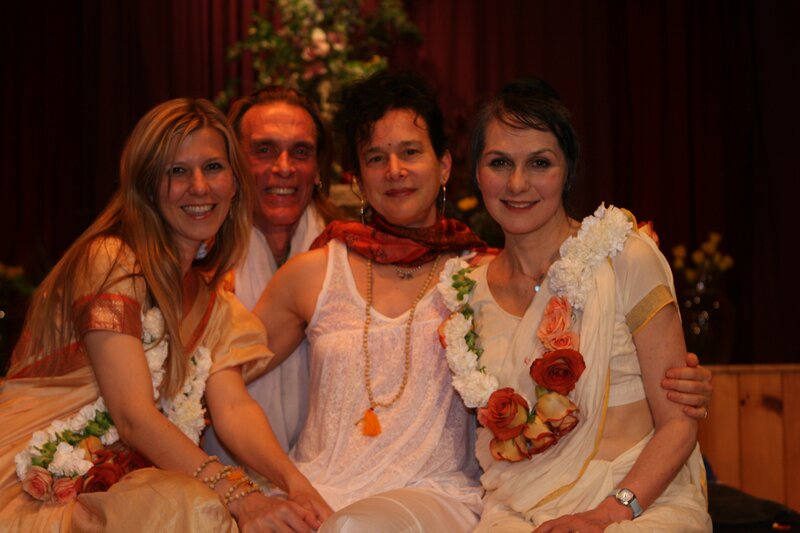 Each of their gurus guided them forward on their individual spiritual paths, and the teachings of their gurus helped shape the development of the Jivamukti Yoga Method, the creation of which was a natural continuation of Sharon’s and David’s own artistic investigations into the mysteries of life. Jiva means “individual soul”; mukti means “liberation.” Jivamukti is derived from the Sanskrit jivanmuktih, which means “liberation while living.” Jivamukti Yoga is a path to enlightenment through compassion for all beings — a revolutionary attempt to reintegrate the physical, psychological and spiritual aspects of yoga for Western practitioners, to make the ancient teachings relevant (and hip!) for modern practitioners. Sharon and David are yoga revolutionaries dedicated to teaching yoga as a spiritual practice, and to reminding their students that they are committing themselves to a demanding mystical journey toward enlightenment. Uh-oh, not teaching any public classes right now. Feel free to contact me about privates or workshops. & don’t forget to subscribe to my blog & newsletter for the latest bliss! Asana practice, at least the way we teach it in the Jivamukti method, is designed to purify the subtle body by opening up pranic pathways & stimulating the chakras. Chakras are repositories of karma — our past thoughts, words & actions — & when we bring them into alignment, we experience harmony in body, mind & spirit. But most of us don’t get on our mats each day & think, “Hmmmm, I said some hurtful things to my partner yesterday, maybe I need to meditate on that while I do some twists to get over myself” (third chakra: ego center). If we did, we’d make much faster progress toward not just waking up, but growing up as well. For, the more awareness we bring to our karma, the more we own it, the quicker we can burn through it & transform our connection to our inner world & the world around us. So, at the start of the year I’m offering a workshop to do just that — & it’s a great way to clean up your act so your intentions stick! In Chakra Tune-Up: A Date with Your Destiny, at the Subtle Mind in Boulder, on Saturday, January 6, from 10 a.m. to noon, we will purge wounds & worries with the magic of mantra, meditation & gentle asana to bring consciousness to the issues in our tissues & resolve to evolve! Disclaimer: Results of this practice may include joy, compassion & unconditional love! I am, admittedly, a Sanskrit geek. Back in my teacher training days, my teacher David Life said, you can either read many translations of the scriptures or you can learn Sanskrit & come to your own conclusions. I took his advice to heart & once I started studying Sanskrit, I couldn’t stop—the language of vibration vibrates to my frequency. I did the two-year program at Naropa University when I moved to Boulder & have been in a private weekly study group for the past six years & counting. Need I say more? O.K., I will: Inversions improve physical health; slow down the aging process; tone muscles and skin; improve circulation, respiration & digestion; increase bone density; strengthen the immune system; reduce stress and anxiety; increase self-confidence; improve concentration; stimulate the higher chakras; and make you feel tranquil, happier, optimistic and spiritually oriented. Who doesn’t want all that? In this workshop I’ll offer the 411 on the king (headstand), the queen (shoulder stand) & the jock (handstand) of inversions so that students, even if they’ve never turned upside down before, will understand how to slowly develop the strength & facility to do these powerful postures safely & joyfully. Fly like an eagle! Or a crow! Or a superhooman! Arm balances aren’t about force, but about leverage, about using gravity to your advantage. They teach you not only about your inner strength but also about your innate courage, playfulness & ability to create a sense of ease & lightness. In this workshop you will learn hot to combine equal parts 1) grace, 2) strength & 3) confidence to soar like you were born with wings & how to keep your wrists & shoulders safe with proper alignment & muscle engagement. All levels welcome. Come play! Ganesh is known as the remover of obstacles, but what is less well known is that he actually puts them there in the first place. Whoa — why would he do that? Because the blocks/challenges/obstacles we face in life help us discover who we really are, guide us to reach our highest potential — as long as we don’t forget the teaching once we’re over the hump. So in this workshop we’ll use yoga blocks to inform our practice, learning to embrace what’s uncomfortable — & don’t be surprised by the revelations that will unfold. What we resist persists & if we can embrace our obstacles we will set ourselves free. Jai Ganesha! The health of the body, mind & spirit is a reflection of the health of the chakras, energy vortexes in the subtle body that are repositories of our karma — our past thoughts, words & actions. In this workshop, you will purge your inner om of worries & wounds with the magic of mantra & asana, getting rid of the issues in your tissues. Sacred energy oils will be used to help you attain harmonic alignment. Resolve to evolve: unblock your chakras & set your soul free! Disclaimer: Results of this practice may include joy, compassion & unconditional love! The path of the bhakta starts & ends in the heart. Bhakti yoga is the path of devotion. Who or what are you devoted to? Who or what would you smack down for unconditionally? Is your heart open enough to do so? This practice invites you to plumb to the core of your being & surrender to the deep well of love that is the essence of who you really are. Bhavalicious chanting & asana that will crack your heart wide open! Cast a spell over your asana practice & turn it into a magical experience: The three secret ingredients of vinyasa revealed! A deep dive into some of Patanjali’s most famous & accessible Yoga Sutras. We’ll unpack the Sanskrit to discuss possibilities of meaning, chant the verses & you just might discover why my teacher David Life says you can find the answer to any problem in the Yoga Sutra. No asana. Sound is God. And what is God but the absolute expression of love, joy and bliss. And because everything in the universe is a manifestation of sound, including us, when we chant and connect to our source in sound, we connect to God. In this workshop we’ll use the power of Sanskrit mantras to take us on a journey to that place where love, joy and bliss reign, which you might call hOMe, and then you’ll know how to bring yourself hOMe whenever you want. Wear comfortable clothes. A wee bit of movement, but mostly sitting. Sanskrit is the mother of all languages, the sacred language of the gods, the vibrational connection to source. Because sound and meaning are the same, by chanting in Sanskrit you can actually manifest the essence expressed by the word. It can facilitate a meditative state, and it is said to even be capable of bringing on enlightenment! In this workshop you’ll discover the art of wrapping your mouth around the Sanskrit alphabet, and why you might want to. You’ll learn why pronunciation matters and get keys to decipher asana names, and you might just finally understand what you’ve been chanting all these years! Let go of what doesn’t serve you and find more balance and flexibility in body, mind and spirit. When you twist, you are literally wringing yourself out: detoxing internal organs and the lymphatic system and encouraging your side channels to loosen their grip on the third chakra, where the ego lives. By using the precious faculty of intention while you twist, you can let go of attachments and aversions that are preventing you from being all you can be. Appropriate for all levels. Come with a sense of adventure. Can’t get to the class you want when you want it? Have a goal that isn’t being addressed in your regular class? Recovering from sickness or injury & need some extra loving care? Want a class just for you & a few friends? For a special occasion? For your employees? I would love to create a special experience designed just for you. Just ask! "You are my favorite yoga teacher! I love your style, instructions, spirituality, adjustments." "Jaimie is fantastic, I've studied with David and Sharon enough to know a great Jivamukti teacher when I meet one." "Just wanted to thank you for a great workshop on Friday - it was awesome. You're terrific. Made me want to dance!"